Maintaining good air quality in your home is important for the health of your entire family. Either too much or too little humidity can lead to the rise of unhealthy airborne particulates. The EPA recommends keeping relative humidity inside between 30% and 50%. 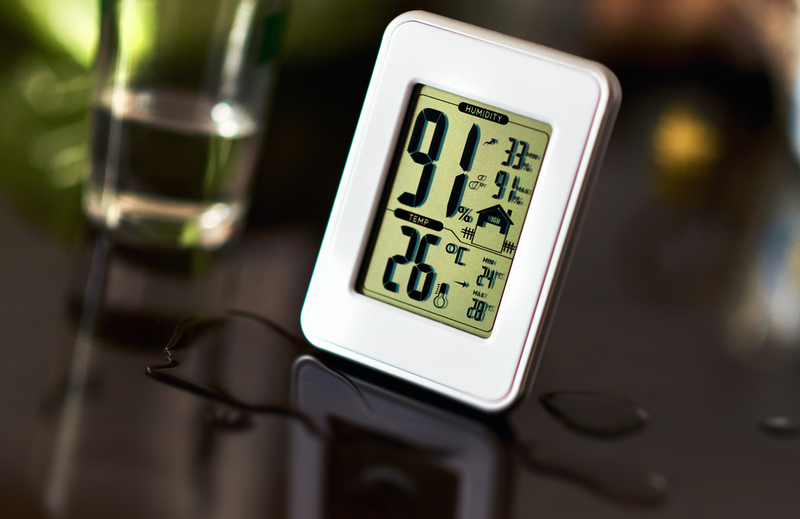 You can check the levels in your home with a digital humidity meter, or hygrometer, which you can find at most hardware stores. What happens if you have too much indoor humidity? Molds produce allergens, irritants and sometimes potentially toxic substances. Mildew and dust also thrive in humidity. Open windows whenever you’re cooking or running the dishwasher to alleviate high levels of humidity. Exhaust fans in your kitchen or bathroom can also help. The easiest way to combat high humidity levels is to turn on your central air conditioner. If that’s still not enough, you might need to invest in a dehumidifier to dry the air. A dehumidifier’s drying capacity is measured by how many pints of water it can remove from the air within 24 hours. You may only need a small dehumidifier to control the moisture in one room or a small apartment. These are relatively inexpensive. Most portable, single-room dehumidifiers are self-draining and come with a drain-hose connection. You’ll need to place it in an area where the hose can empty water, such as a laundry room sink. Dehumidifiers with large tubs or drip pans can hold more and will need to be emptied less often. Some dehumidifiers use evaporation technology, so a drain hose isn’t required. Another option is installing a whole-home dehumidifier. These connect to your existing ductwork and must be professionally installed. Investing in a dehumidifier is one option, but there are also simple design tricks you can use to help reduce your home’s humidity levels. If you’re in the process of redesigning or redecorating your bathroom, consider using mildew-resistant paint and primer. Even if you only use this paint for the lower parts of the walls, it can cover old mildew stains and prevent new spots from developing. You can also swap bathroom rugs for tile floors to prevent mold and mildew from building up. Add indoor plants to decrease indoor humidity and make your home feel inviting. A peace lily can absorb humidity and toxins through its leaves. Peace lilies only need indirect sunlight to grow, making them ideal houseplants. If you’re looking for a plant that can be hung, the English ivy might be the perfect fit. When they’re hung up high, they absorb the humidity rising in the air, and you don’t have to worry about knocking them over. A few simple updates can make a big difference when it comes to the quality of your indoor air. Which tips will work best in your home?